3 - 2..............Bingo von Ellendonk. 3 - 5,5...........Chico von Forell. 4 - 4..............Vello von Fürstenfeld. 5 - 5..............Kira von Romberg. 4,5 - 5...........Bordo von Fürstenfeld. 4,5 - 5...........Citta von Fürstenfeld. Djenna von der Mooreiche was the foundation female for the von Ambassador kennel in Germany. 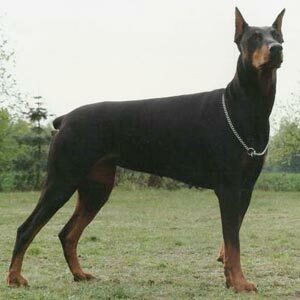 Djenna's sire, Boris von der Weyermühle, passed the Körung 'for life' with highest possible ratings for hardness and working drives (very high protection, fighting spirit, courage and hardness with middle sharpness). Her dam, Brista vom Reuschenberg, is the foundation female for the von der Mooreiche kennel in Germany. Djenna: BH and passed the ZTP with 1A rating for character and G for conformation. She is dam of the von der Kollau “P” litter (Paya).